What is the size of a diamond compartment in this unit? BEST ANSWER: Inside dimension varies from about 13-3/4" to 14". If you look at the picture, you'll see how many bottles will fit in each compartment. With the variation that exists in bottle diameters, I still haven't seen a situation that was different than the picture in compartment capacity - either more or less. This is a nice unit. I have two, one stacked on the other. I connected them together and anchored them to the wall. Easy to assemble and sturdy. I am very pleased with mine. Depending on the size of the bottle, the diamonds will hold between 16 & 18 bordeaux shaped bottles. As I like to quickly view more labels, I usually cut the diamond in half by place a 3/4" thick board horizontally. This provides room for 6 to 8 bottles of 8 different wines. Burgundy shaped bottles do not stack as well. Each of the 4 sides of the diamonds are 13.5" long, and the measurement from opposite corners of the diamond is 19". This effectively stores 18 wine bottles. I will point out that Bordeau-style bottles fit in this wine rack most effectively. Riesling-style bottles tend to slide out of the rack. the size of the diamond compartments vary. The picture is a pretty accurate depiction of how many bottles each section will hold, based on wine type (cabs vs. pinots, etc) The four center bins are ~14.5"x14.5", and the surrounding bins measure ~18" on the longest side of the triangle. Each diamond is 14" on sides and will hold up to 16 standard Bordeaux bottles. Does this have to be bracketed against a wall or can it be freestanding on the floor? BEST ANSWER: I have several of the 120 bottle racks. Yes it can sit on the floor. If you decide to place it on a bench or platform of some kind, make sure the base is firm and level. Remember a full rack weights 200 lbs. (bottles and frame). We have two units standing on top of one another and the top one is bracketed against the wall. If you are only using one unit, it would not have to be bracketed. Here in California it needs to be attached because of earthquake risk. It will freestand but why risk 10 cases of wine? I suggest attaching to the wall fro safe keeping of your collection. Either would work, it's a solid stable rack. It can be freestanding on the floor. It has to be fastened to a wall. How many bottles does each box hold? Take a careful look at the photo - as it is exactly what I've found to be my storage situation. Sixteen bottles is the limit for the full diamonds, while the half diamonds end up with either 6 or 7 bottles per compartment. The other thing that I've learned is that the rack will rarely (if ever) be full - as I have a single wine type in each full diamond, while part cases end up in a half diamond or some itmes in two half diamonds. In my installation, I stacked two of these units - which provides more storage and more flexibility. I also put in two of the Swedish "126" bottle wine racks - which I use when the case remnant drops to a few bottles. I have been very pleased with my wine racks from The Wine Enthusiast! They went together easily, fit well, and make a very solid unit once they are completed and bolted to the wall. in theory the four big diamonds hold 48 and each little triangle holds 12. However, it depends on the bottle. As you start adding burgundy bottles and champagne bottles your bottle count goes down. The only way to get all 120 bottles is if they were all Bordeaux style bottles and nothing else. Each box, or triangle, holds different amounts. The outer ones will hold 6-8 bottles. The four larger inner boxes will hold 12 bottles. It depends on the diameter of the bottle. 16 of a standard bottle, but fewer of larger bottles (eg champagne). 12-16 bottles depending on the size for the center diamonds and the outer bins will hold approximately 8-12. As the name indicates: 120 bottles I think. Closer to 96 bottles than 120. Do you make this unit in 42" wide x 60" high x the 9.5" deep? BEST ANSWER: I have 7 of these units in making a wine storage room that I use for aging home made wine as a hobby. Each hobby wine kit makes 30 bottles and 4 kits fit perfectly in one cube. I age white wine at least 6 months and red wine at least a year. These cubes are an essential part of my wine making hobby! It comes in one box unasembled. You can assemble and add to it or alter the size if you want. I built on to mine myself after I measured how it all fits together. If you send me an email or contact info, I will send you some pics of how I use mine. Each 42" X 42" unit comes in a box. I stacked mine and they look nice stacked together. Yes, since this was the obvious configuration for us. The 60" wide X 42" high would not have fit our space constraints. I am putting this in a very tight space 41". Is it 41" or 43" or 42"? BEST ANSWER: Mine unit measured out at 42 1/4 inches high. If you only have 41" of space, this unit most likely will not fit. I have 7 of them. They are all exactly 42 1/4 inches square. It is 42" x 42". I’m a 65 year old woman. 5 ft tall. In good shape and very handy. I’ve put together lots of furniture however was intimidated by the size of the box for the 120 bottle unit that I am going to store skeins of yarn. Can I put this together myself? BEST ANSWER: Assembly is very simple, basically requiring a screwdriver. You will have no problem. It’s much simpler than , for example, an IKEA bookcase. Assembly is not difficult and it is not a heavy piece. You should be fine assembling it. What is the weight of the jumbo rack? BEST ANSWER: This rack weighs 52 pounds. When stacking, how do you brace it to the wall? BEST ANSWER: Thank you for your inquiry. As it does not come with any hardware, the best way to anchor to the wall would be with an L bracket. If you have any further questions, feel free to call us directly at 800 356 8466. Thank you again. Do you make a version of this which is only 40 inches wide? BEST ANSWER: The Jumbo Bin 120 Bottle Wine Rack (Natural) is only available with the following dimensions: 42 inches wide by 42 inches high. We offer many other racks which might work for you. How many total bins come in the rack? the description says "Eack rack is only two bins high" but only two bins then? or is it 4 bins wide as shown in the picture (making it 8 total bins)? BEST ANSWER: Thank you for your question, the Jumbo Bin-120 insists of 4 full bins in the middle with 8 smaller bins surrounding them. What wood is the 'natural' bin made of ? Is it mahogany, without any stain whatsoever ? what is the thickness of the wood? BEST ANSWER: The wood on the Jumbo Bin is appx .75 inches thick. Any questions please call us at 800-377-3330. Can you hang this on the wall? BEST ANSWER: Thanks for your question. I would highly advise against hanging this on a wall. It is really meant to be placed on the floor. If you wanted to stack one on top of the other you can do that. As long as you brace it to the wall. If you have further questions please call 800-377-3330. Can you stack two of theses units together? BEST ANSWER: Great question. Yes you can stack two of these units. I would suggest bracketing them to the wall. If you have any other questions, please call 800-377-3330. BEST ANSWER: Sure thing. They are listed right below the product description as Size: 42"W x 42"H x 9"D .
Where are the assembly instructions and parts to assemble? How to assemble the jumbo wine rack? I looked everywhere for the bookcase used in the show Moonlight. I bought 4 of these, painted them black, stacked 2 side by side and I now have a 6x6 bookcase that wows everyone that sees it! No warning of a three month backorder. I ordered one of these 5 months ago and it came promptly and was easy to put together. No problems. Happily filled it and ordered another one in December and after checking out am told that it will not ship until the middle of February. No explanations, no warnings, just a simple oh by the way. Terrible way to do business. I ordered this product in mid-December as a Christmas gift. The "product" arrived on December 21, but the box contained a six bottle wine cooler. I called customer service on Christmas Eve and was told that the correct item would be shipped that day, and to please return the incorrect item (which we promptly did). In addition, I was told I would receive a refund on my shipping charges. As of today, I still haven't seen a refund on my shipping charges. Moreover, I was informed that the product never shipped on 12/24 and is now on back order, and likely not to arrive until the end of February. I asked if there was any other way to reconcile the several mistakes and I was informed that, "we'll look into it." I love your stuff but this has been a very bad experience - particularly since this is a much-needed gift for my Dad's cellar. WE screwed up the order the first time, sent the wrong thing. Second order was the storage unit but it had no screws to put it together with. Finally shipped screws to assemble it. Assured me it would be expedited shipping, it wasn't. This whole experience has really raised questions if I should do anymore business with WE. Lack of attention to detail and nothing has been done to make up for the second mistake. No real customer service or care. I am a wine importer and recently added an office/wine room to my home. I bought this item months ago - and liked it so much I bought another one. It is easy to asseble, holds 120 bottles - doesn't take up a lot of space. I purchased the natural wood then stained it to match my office desk - looks amazing! The construction is stable and the product has a great appearance. Love the 16 bottle capacity of the 4 center bins and depending on the size of bottles, you can sometimes store well over 6 bottles in the 8 triangular bins. All this and the price is right! Had to modify one of the pieces in order to assemble correctly. Not that big of a deal...just annoying. Just love this for all my yarn. It was so easy to put together. The screws were missing and I had to go to the hardware store numerous times to get the right stuff but this company compensated me. Once I had the right screws it took this 65 year old active woman 15 min to put it together. Now I need the 24 bottle one but it's been back ordered and yes I still have more yarn. Quite heavy,, be sure to have help moving it around. Very sturdy. Easy to assemble. Worth every penny! We love it!! It was very easy to put together. It's very sturdy. We belong to a wine club and are wine enthusiasts. We highly recommend this wine rack. Enjoy! I NEVER write product reviews. But of the many wine racks I've put together, this was far the easiest. And the materials are just as impressive. This rack is actually overbuilt and probably worth more, esp. since it's less than $1/bottle storage. Only quibble is that the enclosed hex wrench might be a bit tough for those less dexterous folks. But putting it together is a breeze, [...]. No kidding: a great value! Delivery was prompt, and the wine rack arrived in good condition. Some of the hardware had slipped out of the parts bag, but none was lost as the pieces were caught by the styrofoam packing. I'd recommend a stronger back or a better means of securing the hardware so that nothing gets lost or embedded in the wood pieces. We are very pleased with this wine rack. It is made out of very sturdy wood & is very easy to put together. Using it in the basement to hold homemade wine. It holds alot of bottles. Even though the product was marked as available and ready for immediate delivery, it took over a week to get the item. Then there was a 6 hour window for the delivery time. 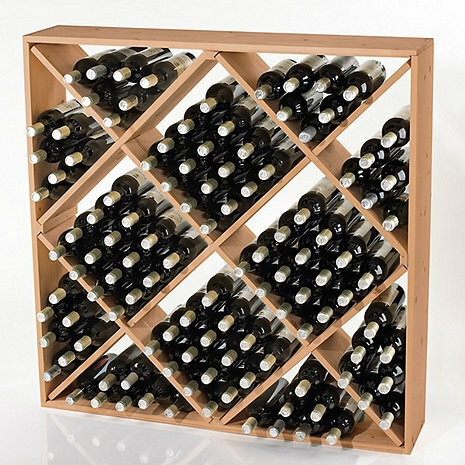 This is perfect for my cellar - very easy to assemble, holds many bottles, and very affordable. I ordered two, and will be ordering more. This is a well-made unit (not lightweight pine), easy to assemble, and sturdy (we currently have about 80 bottles in it). It is exactly as pictured. I am considering purchasing a second unit if my wine supply grows. I use this rack as a divider in my kitchen to separate the kitchen from the breakfast area. It looks wonderful... holds a lot of bottles and there is a nice surface on top of it to put things. I have 4 orchids and giant vase full of corks on mine. This is a very sturdy product and is easy to assemble. I have no complaints whatsoever. This rack is easy to assemble and adds the ability to store 10 cases in a small space. I found it a great rack to bulk age wines that I have made. The size of the rack makes it easy to make a wine cellar and if brackets are used to be able to stack on top of one another for better use of limited space. Arrived within 5 business days of order, using standard shipping. The natural finish is very nice. Heeded the advice from other reviews on clean up. Had a vacuum ready for the foam to keep things cleaner. I also added some brackets that I bought at the local home improvement store under the X's to give it more support and it's able to hold the full load without the flex or sagging that others have mentioned. Delivery was prompt and on time. The boxes (I ordered 2 units) arrived undamaged. The units were in perfect condition. The product is exceptionally well packaged, so it will withstand rough handling in shipping should that occur. The boxes are heavy so I opened them in my garage and carried individual pieces down to my wine cellar where I assembled the units. So Good I Bought Two More!! A year ago I bought 2 of these units for my wine storage needs. They have performed so well, I bought two more to expand my wine storage capacity. It should include some earthquake straps to avoid toppling in a shaker. A simple add that could save a lot of wine. The product itself was good. Easy to assemble and nice when put together. However when it arrived the box was extremely beat up and torn. We thought nothing of it until we tried to put it together. There were four screws missing and the ones we had were lost between the boards. We had to search for them. Not to mention a slightly damaged board. A little frustrating considering we waited a month or more to get in the first hand. Product is nice but shipping was terrible. Works well for holding wine but the finish could be a little nicer. There should be plugs to hide the screws from view. It would finish the piece and would probably only cost the company a few cents to give a nicer product. I really like my new jumbo wine rack--pretty easy to assemble and works great in keeping track of my wine. It arrived without the necessary hardware but I was able to get these at Ace and got a nice credit for buying them on my own. Works best with straight sided (burgundy?) bottles but is OK with any wine bottles including 1.5 L bottles. Looks good and sturdy once bottles are placed in it. I am a home winemaker (from kits) and have several hundred bottles of wine in some stage of finishing-from drinkable to very young and aging in the bottle. This wine rack will hold enough bottles securely to allow them to age. The only problem that I had with it concerned a few of the glued/nailed on strips of woods which serve as anchors for the cross joints. When I unpacked them, there were two which had broken off, necessitating me putting them back on in the exact place where they were needed. It appears that the manner in which they were packed increases the likelihood that these strips of molded wood will fall off during shipment. This item is best used to store those full cases or more that you buy of new release Cab that you want to stick somewhere and forget about for several years. It is NOT efficient storage for single bottles that you want to be getting at for drinking purposes. This is strictly bulk storage. I use it for basement storage. Provides good storage for the price. East to assemble. Be sure not to overload the top. Assembly was quick and easy. Once assembled, the shelves slid about a bit more than I would have liked. When placed against a wall, however, the unit seems stable enough. I wonder what size bottles it holds 120 of, but we'll accept that as an estimate. So far no bottles have tumbled out; thanks to another review, I stored the Syrahs in the lower niches. It seemed best. We use this product in our basement; the unit provides for an adequate number of bottle storage. Fully met our expectations. GREAT PRODUCT, LOOKS REALLY NICE! The triangle areas do not secure the small diameter bottles, particularly the horizontal ones. Box was pretty beat up when it arrived at my house, but all of the wood was fine. Unfortunately, no hardware was in the box. I called customer service asking for information or a supply of hardware. I received an "issue number" and a promise of a call-back, but never received one. Eventually had to go figure it out myself. Failure to call-back a customer is inexcusable. Satisfaction with a good product has been tainted by non-existent service level. Item [...] was very easy to assemble. Much sturdier than I thought it would be. Would buy again for wine room storage. We are home wine makers and also wine lovers. We bought this rack mostly to hold our everyday and homemade wines. It was really easy to assemble, holds a lot of wine, looks good and seems very sturdy. Perfect. Have to be careful about stability, but unfastened use against a wall is fine. Can't put odd shaped bottles in the bottom of a section, and bottle shape may limit overall capacity because of the dividers. My second unit for basement storage of modest priced wine. This is a simple, effective design. Eight screws and you are practically done. Instructions are clear but barely needed. Quality control could be improved. One brace was wobbly and needed to be glued in place. The screws were missing from the package - they did ship them out fairly quickly. Because there is no space between bottles you can pack more in less space, however bottles with sloping shoulders slide out. While the rack is rigid, it is not very wide could tip over in an earthquake; bottles would slide out as well. Probably overpriced - oh well.